<?xml:namespace prefix = v ns = "urn:schemas-microsoft-com:vml" /><?xml:namespace prefix = w ns = "urn:schemas-microsoft-com:office:word" />When I was about 12 years old, I visited one of my close relatives in Saigon, Vietnam. My Uncle Thinh, after carefully examining the lines on my hands, looked into my eyes and said: “You are a smart man, and you will go very far on education; however, many people and events will stop you short before you become successful. The good news is that by the time you turn 40, you will have everything, and your life will be well established.” These words took root in my mind and heart. Every time I faced struggles and failed, I found some comfort in these “magic words” because I believed that it was my fate! In June 2000, I answered the Lord’s call to the priesthood, and my life continued on somewhat quietly until I turned 40! I often hear people say that when a man turns 40, his life begins to go downhill; however, my life was a little bit different because when I turned 40, my spiritual life began to go uphill! In fact, my life completely changed when I celebrated my 40th birthday! Looking back to that special birthday and reflecting upon that transforming event, I still remember clearly the details of what happened, when it happened, and where it happened. I will never be afraid to tell the whole world that the greatest gift I received on my 40th Birthday was the encounter with Jesus in the Blessed Sacrament! It happened on a Friday evening, November 19, 2011, during a private adoration at the tiny chapel at Saint Peter the Apostle in Wilmington Island, Savannah, Georgia. I was alone in the chapel praying before the Blessed Sacrament. The first 30 minutes was normal. I was kneeling, looking at the golden Monstrance standing between two burning candles, and adoring God. I sat down, reflected, and prayed. I asked Jesus to give me a new heart because the Words of God in Ezekiel came up in my mind at that time: “I will give you a new heart and place a new spirit within you, taking from your body your stony heart and giving you a natural heart.” Suddenly, I began to see an image of Jesus, appearing right in the middle of the consecrated host, and He was looking straight at me! I was so happy to see Jesus because as soon as I saw His face, He gave me a new heart instantly, and my heart began to beat faster and faster until it danced for joy! I kept looking at Jesus’ beautiful face which had an oval shape, with large eyes (the right eye was a little bit further from the center and bigger than the left eye), high-long nose (the upper part of his nose bent or curved a little bit to the left), and balanced-thick lips, and I said to Him: “Please, don’t move,” so that I could take his picture! I think that Jesus did not have any objection at my request of taking his picture because He just stared at me and didn’t say a word. Maybe He said “No”, but at that time I could not hear Him or get His message as I had already made up my mind and decided to take His picture anyway! I took several pictures of Jesus that evening from a different angle and locations with a small digital camera that I often brought with me. Today, I no longer carry a camera inside my pocket; however, I do have a small, much lighter cell phone which can perform a similar task. I think that Jesus’ image will be captured again if He re-appears in any chapel or consecrated Host! Thank God that all the pictures that I took that night came out great. Several pictures had a clear image of Jesus’ face, and one of them was an extra-ordinary high quality because ordinary people can see Jesus’ face with details! After I made sure that Jesus’ image was captured and securely saved in my camera, I left the adoration chapel and went home, wondering what would happen the next day! Actually, I couldn’t sleep all that night because my mind was more than 200% active. That night, I tried to sleep, but my mind was too busy processing the event that just had taken place and wondering the future possibilities: Will Jesus “appear” again and “remain” there and beyond? Will I get to see Him again tomorrow, the next day, and days after? What do I need to do to please Him, and how should I act, or what do I say when I sit in front of Him? Moreover, I tried to understand the message, especially the reason why Jesus “appeared” in the Eucharist before my eyes, and what did He really want from me? Actually, I was very excited about seeing Jesus, and my new heart kept acting in a strange way. In fact, my heart was delighted and rejoiced; it made me feel very good, just as if someone who has had a great massage. I soon found that since the event that my heart was dancing “like the bells ringing in the Jingle Bells.” I further noticed that my heart performed the “Jingle Bells Style” every time I sat down and prayed, so I began to pray more often because I wanted to keep the joyful spirit of Jingle Bells ringing in my heart. I also wanted to stay connected to God before the Blessed Sacrament, the real Presence of Jesus, and I wanted Jesus to give me more of that joy and goodness. 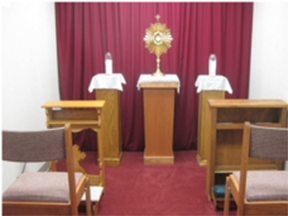 With all the excitement and wonders, I returned to the Adoration chapel the next day, my birthday, and to my surprise, after a few seconds looking at the Host in the center of the golden Monstrance, I discovered that Jesus was still there waiting for me! He looked at me, and I stared at Him for quite sometime. His image did not change, and probably it will never change because the Nature of God is faithful, and God is very generous and giving. Whatever He gives, He never takes it back! That’s why His face visibly remains in the Consecrated Host! He looked the same as I first saw him a day before, with no new make-up or anything of that sort, probably because He wanted me to recognize Him easily as a person or to identify Him as the same Jesus. He appeared at the same angle, location, and position on the Host; in fact, he was exactly the same as yesterday. His eyes still opened big, and He was gently looking at me. I did not hear any sound from His mouth or see any kind of movement on His face, including His lips. I was not quite sure if He said anything to me because I had yet learned the pattern of how He talked or communicated; however, I truly had a sincere desire in my heart that I really wanted to be able to recognize His voice, to hear His Words, to understand His message, and to be able to respond. Going to see Jesus was the only reason that brought me back to the Adoration chapel day after day because I really wanted to see the face of Jesus again and again. 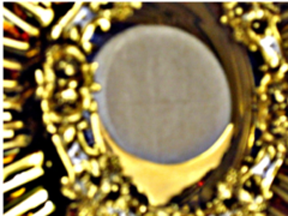 Once I saw His face in the Eucharist, the image immediately imprinted in my mind, and it kept refreshing my heart. Even though I just saw Him yesterday, I missed Him terribly already because He loves me, and I am strongly convinced that He is real, He is living, and He is truly present in the Eucharist! Lying in bed that evening, I couldn’t wait for daylight to arrive, so that I could go back to see Him, to be with Him, and to talk to Him. I wanted to be closer to Him because He is God who raised me up from dust and death, transformed my life, and gave me back human dignity. Also, I wanted to love Him dearly, to become His “best friend,” and to serve Him better. My heart kept dancing the whole time when I was with Jesus in the Adoration chapel or when I prayed alone in my private home, and this lasted for 3 days in a row. I felt so good inside my chest each time my heart performed its dance because I could tell that my heart was doing something extraordinary. Suddenly, I realized that Jesus gave me a new heart, and that was what I had prayed for before I saw Him; however, I forgot to invite Him to live inside my new heart, and that was a big mistake! I often hear people say: “If you can’t do it right, don’t do it at all,” and “if you make a mistake, get up, and try again.” They are right. But I must confess that I didn’t do it right; I made a terrible mistake, so I got up and tried to do it all over again! I immediately returned to Jesus in the Adoration chapel, kneeled before His Presence, and made another request, and I couldn’t believe that the best had yet to come! You know what? As soon as I finished expressing my thoughts or presenting my prayer to Jesus, my heart began to jump faster and vibrate much stronger! My spirit was more joyful, and I felt a cold, electrical movement spreading into every part of my body! It spread from head to toe and from soul to all its nerves! It’s the whole body, and it’s truly an experience of the Divine Joy! This phenomenon lasted for 2 weeks, and during this period I felt like heaven each time I prayed because my whole being was “massaged” by God! I was truly in touch with the Divine. That was the reason why I began to pray more often, and that was also the reason why I could pray continuously for many hours without feeling tired. In fact, I began to recite the rosary, the Divine Mercy, and St. Gertrude’s Prayer non-stop; it was a joy to pray, and I could say with love! I could easily pray 10, 20, or sometimes 30 sets of rosary a day, and by God’s grace I was able to keep up this particular practice to the present day. Also, I went to visit the Adoration chapel several times a day beside my priestly duties, and each time I sat in front of Jesus for 2, 4, and sometimes 8 hours! During the night time, God also sent an angel to wake me up to pray. That faithful angel was always “on time” and very consistent, and He often “called” or touched my shoulder around 1:00 AM every night. It was very difficult for me to recognize his “call” at first, but I slowly learned and adapted by responding to his “mission” and following his instructions. After I mastered the first round, He began the second one by waking me the second time at 3:00 AM, and this round lasted for another 2-3 months. Finally, during the season of Lent in 2012, He woke me up the third time at 5:00 AM, and thank God, this lasted for only 40 days! It was like a spiritual exercise that I had to wake up 3 times each night for prayer; however, I did not feel tired because after responding to the angel's calls, I went back to bed and easily dropped dead before snoring! In fact, I could easily fall asleep and had many sweet dreams because I was at peace, and I have lived in Jesus’ Peace ever since. A short sleep after each call seemed to last for eternity because I could easily identify it as a source of comfort, which was Jesus’ reward, and it was wonderful. Even though I only had a 15-minute nap, a half hour rest, or an hour of sleep between each calls, I felt like I already slept for 8 hours or more, and my body was fully charged. My energy was totally recovered, and I was always ready for the next day’s mission full of joy and love. Another important aspect of the deal was that during the whole season of training, the Devils were also present; they regularly came and tempted me many times. They tried to disturb me by making difficult changes in my plans, causing different pains, or bringing more problems into my family and friends. Also, they made me angry by destroying my personal properties, and most importantly, they tried to distract me from my goal by providing me many golden opportunities to commit sins of the flesh, get more money, and be happy by possessing more things of this earth. I was very glad that the Prayer to St. Michael the Archangel was so powerful and effective because every time the Devils came to bother me, I said the Prayer of St. Michael the Archangel, asking him to help me, and he came quickly to my rescue to take good care of me. Probably he was not very busy because he finished his duty in a super short time. The Devils frequently came at night to try different kinds of tricks on me. In fact, they violently shook my bed, wrestled with me, and they never let me rest peacefully. Other times they set off the alarm, interrupted phone calls, or interfered the channels of frequencies with their own voice or noises. Once in awhile, they entered into my dreams and sowed seeds of anxieties or deeds of nightmares. Ultimately, they tried to make me scared, but they didn’t dare to destroy me because Jesus really cares about me. Jesus truly loves me, and at the end He always comes to my defense even though I have to change. Sometimes, the Devils were angry when Jesus set me free from their powers, and He let me conquer in giving me freedom and freewill to choose God who is love. Importantly, the Devils got so angry when they realized that Jesus truly loved me, and He continued to give me greater gifts which included these two things: First, He let me see His face in every Eucharist, in any Host, large or small, and at any church or private homes. Secondly, more people began to fall in love with the Holy Eucharist, especially to believe in Jesus because they too had seen the image of Jesus in the Host which I showed them at the Altar during Mass or at their time of convenience. After everything was unfolding and learning from what was happening, I could tell that the image that appeared in the Eucharist was not just a normal image, but a living Person, Jesus Christ, who talks and communicates. He has absolute powers to do what he wants. He has a direct control over me because I can no longer fight but surrender to Him completely, and He is actively involved in every decision of my life. Jesus often chastises my heart to show me the true value of love, especially the value of true love which demands sacrifice, to teach me the virtue of obedience, to make me strong even in the case of hopelessness, and to prepare me for difficult challenges that I must remain faithful when everything seems to fall apart. Jesus has chosen me to be His “slave,” and He is also the One who has blessed me with the gift of true Peace. He is a very jealous God who demands that I have to put all my trust in Him. He wants me to let go of all worldly attachments so that I can be free, and that I can empty of myself so that He can fill me up with the Holy Spirit which is a greater gift and better blessing! My Uncle was right when he said this: “By the time you turn 40, you will have everything, and your life will be well established;” however, his “prophecy” accidentally came to fulfillment not in terms of human success, but heavenly rewards. What my Uncle really meant was material wealth which includes honor in this world and powers on this earth; however, he didn’t realize that there are other kinds of treasures that are greater than this world’s, and there are other types of spiritual gifts that are much better than this earth’s! Well, to keep my story short, I would like to say that my life has completely changed when I turned 40 because I have found Jesus who has everything that I need, and He is everything that I have. I am very happy to have Jesus, for He is the greatest treasure of my life! Jesus gave me the best gift on my 40th birthday. He blessed me in letting me see His beautiful Face, the Face of God! He gave me a new heart and filled my life with divine joy. He set me free and granted me the gift of His peace. He trained me to become his friend, a person of prayer, and a minister for his Church. He speaks to me and I am now able to recognize His voice. He talks to me, and I am able to hear and understand his message. He communicates with me, and I am able to respond in love. I am Jesus’ soldier who was fully armed. I know that Jesus truly loves me, and He deserves my best love! He gave me everything that I ever need in life, which includes the Divine help at any time or spiritual assistance in any situation. After passing through many different kinds of tribulations in life, I have discovered that Jesus is truly a loving God, a faithful Friend, and always remains as my Boss! He is all that I have. He is with me, dwells inside my heart, guide me all the way, and will help me in difficult time, especially in the journey of faith. What I like the most is to live in His Presence every moment and every day for the rest of my life. What a divine gift! Praised be Jesus Christ now and forever and ever! Amen.